1) A White House adviser indicated this week that President Obama expects to ease Cuban travel restrictions at the upcoming Summit of the Americas. 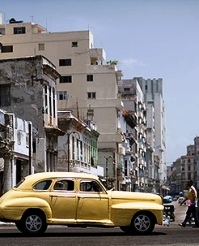 The Associated Press reports “the administration is also looking seriously at calls from some lawmakers to allow all Americans to travel to Cuba.” While such measures wouldn’t change the 47-year-old embargo, they may improve diplomatic relations between Washington and Havana—perhaps a small step in the direction of decriminalizing Cuban cigars. 2) After an overwhelming vote in the House of Representatives, the FDA is one step closer to regulatory authority over tobacco. The bill, which we have been following since last July, may ultimately result in nicotine controls and substantially limited advertising of cigars in magazines and on websites. Passage in the Senate is by no means a guarantee, but the bill has a better chance than it did in 2008 when it faced a veto threat from President Bush. 3) Inside the Industry: Tatuaje has announced a new blend that’s called the “La Verite, Tatuaje A.O.C.”; it’s set to ship next year in cases of 100 for $25 per cigar. Illusione creator Dion Giolito is releasing a new Nicaraguan puro featuring a corojo leaf from 1999 named the Epernay (after France’s champagne region). Ernesto Perez-Carrillo’s new venture, EPC Cigar Co., is launching and will be focusing on small-batch premium cigars. 4) Around the Blogs: Stogie Review smokes a Tatuaje Petite. Keepers of the Flame smokes an Avo Maduro. Stogie Fresh lights up a San Christobal. 5) Deal of the Week: Once again we’ll point out these terrific deals from Cuban Crafters. Included are highly-rated sticks like the Don Kiki Brown ($33 for box of 25! ), Cabinet Selection ($50 for box of 25), and Cameroon ($60 for box of 25). Grab yours here. Has anyone else thought about how items 1 and 2 can work against U.S. interests? With the added flexibility of travel to and from Cuba, the illegal importation of Cuban cigars is likely to rise. Meanwhile, cigars legally purchased in America will become more expensive. What's that going to lead to?